More smoky, hazy air blanketed much of the province Monday as hundreds of wildfires continued to rage across British Columbia. 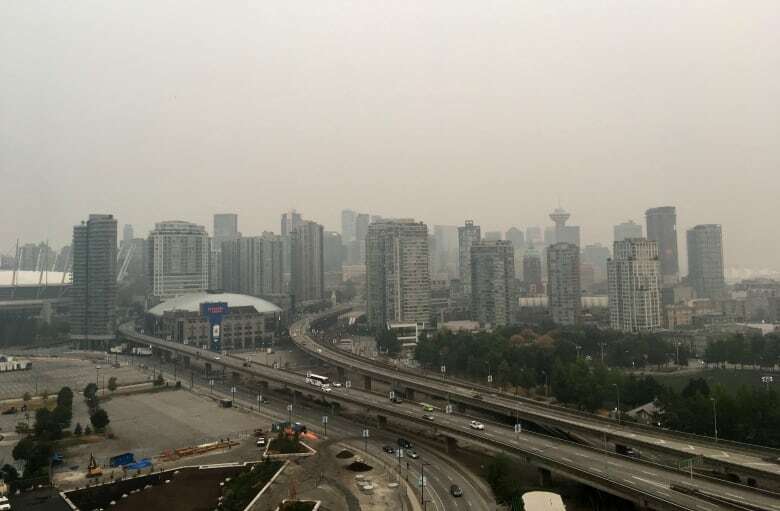 The wildfire smoke blanketing Metro Vancouver has grown so thick that the air quality health risk hit the highest rating in some areas Monday. According to the B.C. air quality data map, Burnaby, Vancouver, North Vancouver, Coquitlam, Maple Ridge and other parts of northeastern and northwestern Metro Vancouver had a 10+ rating as of 11 a.m. PT. Monday. 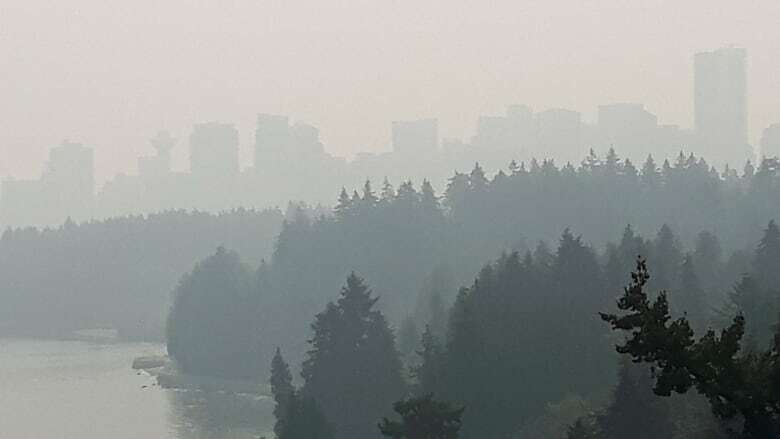 The 10+ rating means the health risk is very high and there are high concentrations of fine particulate matter in the air, according to Julie Saxton, an air quality planner with Metro Vancouver. "Certainly, conditions are not good," Saxton told Renee Filippone, guest host of The Early Edition. "Certainly, when I step outside and the levels of fine particulate matter are high, I find myself coughing, and it really makes you think, perhaps I need to take more measures to stay in a cleaner space." With a 10+ rating, the province advises the general population to reduce or reschedule strenuous activities outdoors, particularly if you have symptoms such as coughing and throat irritation. Children and the elderly are advised to avoid all outdoor physical exertion. At an outdoor soccer camp in downtown Vancouver on Monday morning, parents were advised of the health risks and were given the option to pull their children from camp. 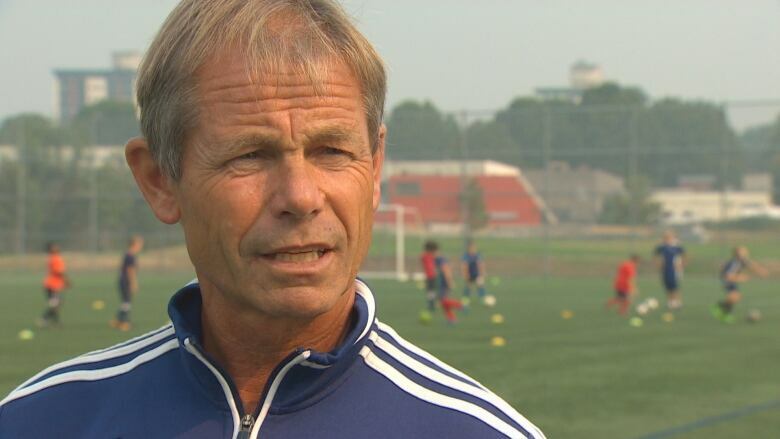 But Steve Weston, head coach of the Vancouver Athletic Football Club, said all the parents opted to let their kids play. The afternoon camp for older players was cancelled, however, because the focus is on team training, fitness and agility. "They tend to be older players who want to go hard," Weston said. "We'll evaluate again this evening and tomorrow morning to see if we do the same or if we up the tempo or, if the air quality gets even harsher, whether we cancel altogether." 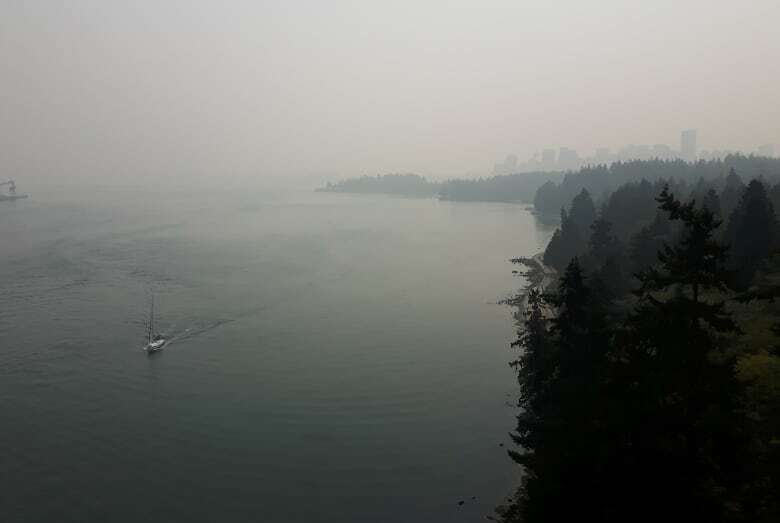 It's been a week since Metro Vancouver issued the air quality advisory and, according to CBC meteorologist Johanna Wagstaffe, the smoke will likely remain thick for the next couple of days on the South Coast. Harbour Air said Monday that flights to and from Nanaimo, Vancouver, Tofino and Whistler were affected by low visibility. On the weekend, flights at several airports in B.C. 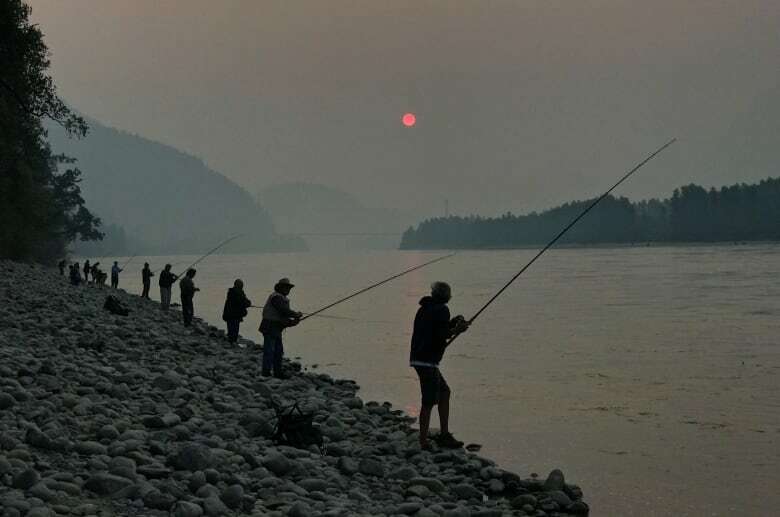 's Interior and West Kootenay regions were cancelled or delayed due to smoke. For those wanting a break from the smoke, Saxton said indoor spaces with air conditioning tend to have the cleanest air. "We talk about places with large volumes of air where they probably have air conditioning and they are probably cool environments. Places like shopping malls, community centres, swimming pools," she said. Although surgical masks may give people a sense of security, Saxton said they are not an effective filter for fine particulate matter, which is so small it "can penetrate deep into the lungs." 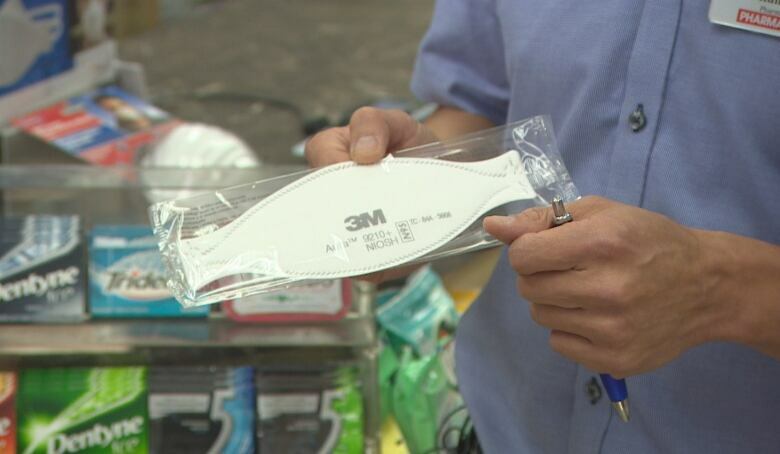 However, pharmacist Kunakar Pou said some respirator masks can be effective for certain people if they have underlying health conditions or have to work outdoors. "But I think best yet is trying to stay inside as much as possible," Pou said. Pou says masks that are labelled "N95" can filter out some particles but a person without respiratory or pulmonary problems is not likely to need one. At home, a portable air cleaner can reduce small particle concentrations by 40 to 80 per cent, according to studies cited by Vancouver Coastal Health spokesperson Tiffany Akins. She said the use of portable air cleaners has been associated with better lung function, lower blood pressure, and reduced inflammation in children and adults. Blanketed by wildfire smoke, morning skies were an eerie orange in Prince George, B.C.